Reston, VA – Nov. 1, 2017 – Odin, Feldman & Pittleman, P.C. 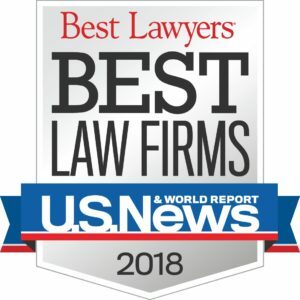 again has been named among the nation’s “Best Law Firms” in the 2018 edition of U.S. News – Best Lawyers®. Based in Reston, Va., the firm ranks nationally in 7 practice areas and regionally in 16 practice areas. Firms included in the 2018 “Best Law Firms” list are recognized for professional excellence with persistently impressive ratings from clients and peers. Achieving a tiered ranking signals a unique combination of quality law practice and breadth of legal expertise.